"I don't know how you think it's ever gonna get better if we don't spend time together." Oh, there's nothing we fellas like as much as a shiny new toy, ranging from electric trains to iPhones, and what is a modern man without his gear? 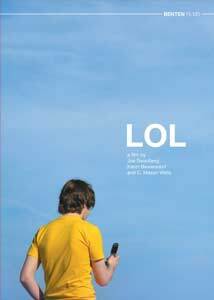 LOL is essentially about how young men allow the hot new technological object to stunt their emotional development; it's a movie about a group of guys who are so crippled interpersonally that they'd rather spend their time in an IM circle jerk than sleeping with girls. Clearly they're supposed to be emblematic of a millenialist generation; it's not for me to say if they're representative or not, but cinematically, they're like the guys from Diner with PowerBooks as crutches, or the cast of Carnal Knowledge or In the Company of Men with a little less venom and a really sweet broadband connection. The film is a series of loosely connected vignettes, essentially, about a group of buddies who hang out in Chicago, and need the steady murmur of their devices to keep them together�an hour without Internet access is like an hour without oxygen for these guys. One has actually managed to hold on to a girlfriend, but she's chafing at continually coming in second to whatever the hell he's up to with his laptop; another has convinced himself that the young woman he watches online is really into him. (He's like the liquored-up guy in every strip bar, convinced that she likes me, man, she really likes me. Not that I'd know anything about those places, honey.) And another is working on his magnum opus, a cacophony of human noises edited into a sort of percussive symphony�he knows how to ask women to make random sounds for him, but when it comes to something more intimate, has all the awkwardness of a pimply adolescent. It's kind of a great take on all the crap that pollutes our lives�we've got access to more information but no wisdom comes from it, we can get in touch with anyone in a millisecond but so many of us feel alone, and we insanely give priority to someone on the other end of a cell phone call rather than to the one standing right in front of us. It's a canny criticism of the potential evils of technology without being at all Luddite, but in truth the film makes these points pretty quickly, and even at an hour and twenty minutes, it occasionally feels padded out. It may simply be the power of suggestion, but about halfway through the film's running time or so, you may find your mind wandering and your body getting up to check your own e-mail and voicemail and all the rest of it. As you might anticipate with this sort of subject matter, there's a great facility in the making of the film, which was clearly done on a low budget, with more inspiration and creativity than personnel or gear. The cast brings a nice improvisatory naturalism to the material, but sometimes they're inarticulateness seems just a bit too hobbling; they can be a little wooden and amateurish, which can be endearing, but they do seem to lean on the meandering house style a bit too much, maybe. But overall it's a thoughtful and stylish undertaking with plenty of food for thought, and offers a whole lot more than you can fit into an IM. Image Transfer Review: The project was shot on video, and as a result can look overly contrasty; the transfer is a respectable one, though the image quality isn't particularly high. Audio Transfer Review: The sound can be tougher sledding than the picture, but again this seems like the limits of the recording equipment, and not the transfer. Extras Review: Director Joe Swamberg participates in both commentary tracks, as do a couple of his collaborators. The first is more technically oriented; auteurism doesn't have much of a place here, as this was obviously an intensely collaborative effort. It's also a great discussion of the accelerating half life of technology�the film was made just before the omnipresence of YouTube, for instance, which no doubt would have changed the flavor of some of the video interactions. The three are joined by a couple of cast members for the second track, which is full of lots of set chatter, remember-the-day-we-shot-that-scene stuff, and so on. Hissy Fits (07m:04s) is a short that was made as a test for the feature�you can see Swamberg and company finding both the characters and the style of the piece. A series of production podcasts (09m:29s) emphasize the film's composer, who worked in Germany; it's also heavy on the production's active cultivation of irony. The videos from the feature are collected (09m:47s), and an additional video (02m:39s) offers some techno sounds over the galvanizing images of a man soldering. Actress Tipper Newton (who also appears on commentary #2) is interviewed (07m:42s) in and out of character, and a slideshow of artwork offers some great illustrations of technology getting in the way of intimacy�these were images used for posters, film festival fliers, and the like. Finally, an accompanying booklet features an essay on the movie by David Hudson. If you can go without an e-mail fix for a whole eighty minutes, you'll find a technologically ambitious and sociologically astute look at the unintended consequences of the unfettered access to information and each other: just that much more noise. You've got to respect the intelligence and the craft of the movie, even if it can get a little repetitive.